Going back many years now I was very interested in experimenting with psychoactive plant derived substances that reputedly enhanced ones ability to experience higher dimensions or altered states of consciousness. One plant I was particularly interested in due to it’s historical use by Egyptian priests and depictions in Egyptian art was the Sacred Blue Lotus or the Blue Lilly of the Nile as I knew it back then. I was particularly drawn to this plant because I read that it could be used to help induce lucid dreaming experiences or if not taking one to that level of lucidity during dream states then to enhance dreams giving them an extremely vivid quality. I had experimented with a few different mind altering substances considered to be psychedelic in nature and found them to be interesting but did not feel that they particularly gave me anything spiritual. When I say spiritual I’m referring to higher feelings or mystical experiences that don’t involve huge changes in perception but I still feel in my heart that certain psychoactive chemical do have a place in the world through their use as a medicinal treatment and their potential to grant personal insight into ones own nature. The Blue Lotus however proved to be different. Firstly I’d like to explain the two different ways in which I experimented with this plant. The first time I managed to purchase the plant material I was told the product was material from the Blue Lotus plant soaked in extract from the flower. I smoked this through a water pipe before I went to bed. It was on this occasion that I experienced one of the more profound vivid/lucid dreams I’ve had. This happened only a couple week after I had purchased a book on Astral Travel with an esoteric dream symbol guide in it for dream interpretation. The second time I experimented with the Blue Lotus I drank a glass of wine that had lotus petals soaking in it for a few days. On this occasion I had no significant dreams that night and in fact the drink was quite disagreeable with my digestive system. It made me feel very physically relaxed but mentally excited which essentially kept me from going to sleep immediately after ingesting it. My dreams that night were very mundane in content with no obvious symbolism present but rather just the normal everyday things in life. It was almost like I was living my daily life through my dream by going to work as usual with my daily routine. The Experience after smoking this extract I went to bed about ten minutes later. I didn’t feel any different than I had on any other night. I was hoping in my heart that it would help me experience the Astral Plane but I was mostly skeptical as when researching other peoples experiences on the Internet I could not find anyone who had confirmed through their own experience that this plant was capable of helping people to experience lucid dreaming. Nonetheless I wanted to keep an open mind and see what happened for me. Through the years that I have been lucid dreaming I’ve found that I mostly wake from a dream state to realize I’m dreaming during the hours between midnight and the early morning and unless I manage to astral project straight from going to sleep I more often than not do not have lucid dreams during my first hours of sleep. This night was different. I didn’t astral project but went straight into an intensely vivid dream state where I was a bird of prey, red breasted with multi-colored wings and tail, flying gracefully along a coastline of cliff faces and a pleasantly calm sea. The feeling within was one of the most amazing senses of freedom, happiness and contentment. I’d never felt anything so incredible in my daily life (including during psycho-actively induced experiences ~ they cannot even be compared as they are so far from the true feelings of freedom that are possible) and to this day I can say that only on a few occasions have I felt this level of freedom within. I’ve felt inner peace and inner quite but this feeling is on a whole other level. It makes sense to me that this is what I would have felt within as being a bird of prey you are the top bird, the king of the sky and as you can imagine the idea of having the ability to fly and feeling such strength that nothing can touch you is symbolic of the ultimate sense of inner freedom. As I flew along the coastline, enjoying every single moment with it’s inner ecstasy I suddenly noticed something in the distance. I could see a gap in the cliffs where an inlet or a pool was located. It caught the attention of my mind and as soon as I thought about it I was instantaneously located over the inlet. The inlet was surrounded by cliffs and had a small beach area on one side. The next moment after finding myself over the inlet I felt a great fear overtake the freedom I had within. The fear was very specific in its nature. I became afraid of losing this magnificent feeling I had within. It was like flying as a bird and all of a sudden being afraid that your wings will stop working. As I felt this fear I naturally looked down to see what I was going to fall into if I did fall. In the inlet where three shark fins swimming in a circular motion around the spot if was hovering over as if they were watching me just waiting for me to fall. This made me even more afraid and I became scared that if I did fall the sharks would eat me alive. Ironically, it was with this fear of the loss of the ability to fly which led to a fear of being eaten if I did lose my ability to fly and this fear what led to me falling. So just like that, in a instant, I dropped straight out of the sky as if I had been shot down. But it was not a bullet from without that brought me down, it was a bullet from within. As soon as I hit the water I transformed back into my human self, plunging about five meters under the water. Once I settled underwater I looked around and in three directions these massive great white sharks were swimming straight for me with extreme force and speed. In this moment I knew I had to do something or I would be shark dinner. It was this drive to get myself out of this situation that “woke me from my dream”, meaning I became lucid or rather I realized I was dreaming. Although I realized I was dreaming the situation of the dream did not change and in my view it was a part of the symbolism of the dream. I feel waking into lucidity at this moment was symbolic of the inner realization of being in a dire situation internally after falling from the heights of success. Symbolism often works on many different levels with lesser or greater extents of complexity and this is what makes it esoteric and not just simple equations of “this equals that”. I looked up to see how far the surface of the water was to consider weather or not I could swim to the top and escape the shark attack. But when assessing I knew that they would intercept me before I reached the surface. In my desperation to escape I closed my eyes and mustered up every piece of strength within me. The sharks were just about to get me and I could feel they had opened their jaws and were only a couple of feet away. I pulled everything piece of strength I had within and when it had reached maximum intensity I propelled myself straight up out of the water into the air like a rocket and managed to land on the beach of the inlet. It all happened very quickly. I was a bird, I fell into the water, transformed back into a human and propelled myself out of the water to evade the hungry sharks. It felt like it all lasted for only a few seconds but the experience was so very real and vivid it seamed to go on for a very long time. I can comfortably say that it was as real to me as the experiences of daily waking life. As I stood on the beach I looked out upon the sharks who were still trying to pursue me with the shallow waters being the only thing between them and I. At this point a great feeling of relief came across me coupled with intense feelings of remorse as I rued to loss of my ability to fly free. The next morning when I woke I still had the feelings from the dreams lingering. It didn’t feel bad though, in fact it felt very good, as I feel every lucid dream is an experience to appreciate. I had only possessed the esoteric dream symbol guide for a short while and wasn’t too familiar with it but I knew deep within, without one shred of doubt that this dream was a teaching. Perhaps it was a teaching from my own inner being trying to show me something about my past and the inner spiritual climate I found myself in now. Once I consulted the symbol guide I knew exactly what it meant, and it confirmed my intuitions about what this dream meant as well as what I had suspected about myself for a very long time on an intuitive level. For some time after, the feeling of relief stayed with me but not because of the escape from the sharks jaws but rather from gaining an experience through which I learned something about myself that I simply could not have learned in any other way. This was different to being told something because I lived through and experienced what I was being shown. I experienced every moment of it, not imagining what it would be like to experience something like this but actually “being the experience”. This is by far the most profound way to learn about yourself. You learn through the knowledge and experience of the heart, not through the comprehension of the head. To this day this experience stays with me as a constant reminder to not become attached to the fruits of my efforts. To not fear the loss of my inner peace nor fear the potential dangers of what may lie ahead. Fear is a tricky inner state. It can be very easy to mistake a desire to protect something you value with a fear of loss and an attachment to what you have gained through your efforts. In between this fear and attachment is a state of stillness where you do things because the heart compels you do it and the logic of what you do may or may not be obvious because it goes beyond the comprehension of the level of the human mind. It’s not that you shouldn’t protect what you value but rather that you should try not to protect it out of fear or out of pride. This is very difficult to do and is something I think is fundamental to knowing the differences and interactions between fear, love and attachment. Basically, you can defend something without being afraid. You defend it because it is the right thing to do not because you are afraid of doing the wrong thing or of losing that which you are defending. This experience was the greatest lesson I have been granted on the subject of ‘fear and spirituality’ and I cherish this lesson everyday. It helps me let go of not only the fear of failure but also the desire for success as the two are intrinsically connected. It is something I continue to learn more and more about on a daily basis and this lesson is the single greatest reminder for me to not become attached to my spiritual abilities or my spiritual identity. I can’t say for certain that this dream was due to the use of the Blue Lotus. I only deduce that it may have had some sort of influence as I had never had a dream of this type of quality up until that point even though I had other mystical dreams and had astral projected many times previously. I knew that the Blue Lotus was said to help with lucid dreaming but had not spoken or come across anyone who had succeeded in using it for this purpose. The fact that this plant was considered to be one of the most sacred of plants to the Ancient Egyptians also gives weight to the argument that the plant had something to do with my experience. From what I’ve learned from Esoteric teachings, I know that the Ancient Egyptians are said to have possessed deep esoteric knowledge of the nature of life, humanity and the world which may be the reason why there is so much mystery and lack of understanding surrounding their civilizations and religious practices. I think it’s important though to note that the Egyptian civilizations spanned a vast period of time and to assume that the culture and religious practices were the same at the end as it was in the beginning, is in my view folly and naive. Perhaps at some stage the priestly caste knew of the potential for Blue Lotus to be used as an aid to accessing information on the astral plane but over time this knowledge was lost or misinterpreted at some stage and the Blue Lotus lost it’s place as an esoteric aid and came to be used as an intoxicant. This may be why some believe the depictions of wine with the lotus in Egyptian art was the method by which they consumed it. I find it interesting from an esoteric perspective to consider that wine is often interpreted a symbol connected to meditation and the bliss that can be gained from drinking wine. Maybe the depictions were meant to be symbolic of the affects that the lotus can have when consumed in a specific manner. When juxtaposing my two experiments with this plant, one inhaling the smoke and the other consuming the wine, I found the physical affects were extremely different. The wine felt like I had consumed alcohol, because I had, along with a sedative effect on my body and a heightened state of alertness but the smoke didn’t effect my immediate state of consciousness or the feel of my body. I don’t know if I would have had lucid dream experiences if I had gone to bed after drinking the wine but the fact that even though I wanted to go to sleep to see if it would work, then after consuming the wine I no longer felt like I could go straight to sleep and the fact that when I did sleep later on I had very mundane dreams indicates to me that consuming Blue Lotus in this manner does not affect the consciousness in any way that may help with lucid dreaming. I find the story of the Lotus Eaters in Greek Mythology referred to in Homer’s Odyssey quite interesting with it’s symbolic narrative and how the Lotus Eaters fit into it. Odysseus and his men were swept off course by adverse winds which directed them to landing on an island inhabited by the Lotophagi (Lotus-Eaters). The story tells of how a few of his men were sent to investigate the native inhabitants of the island. The men came across the people known as “Lotus Eaters” and were offered some lotus to consume. On consuming the lotus they found it to be so delicious that they no longer yearned to continue their journey home but wished to remain on the island in the state of bliss they had found by consuming the lotus offering. When Odysseus found them he forced them back to their ships against their will knowing that once they had overcome the effects of the lotus they would once again wish to return home. In my view the myth of the lotus-eaters is representative of the abuse of an earthly plant that has the power to help people let go of their attachments and desires but by consuming it in excess and becoming dependent upon it to reach these states the individuals essentially forget themselves, their duties and responsibilities. It may also be a clue as to how a lotus should and shouldn’t be consumed. Perhaps this is why God’s and Goddesses are represented sniffing the flowers to consume it’s perfume through the nose as opposed to eating the lotus like it were a food as by ingesting it we essentially destroy the flower and it’s fruits with seeds that it could have bared if left to mature with time. The Lotus/Lilly is a very prolific symbol in spiritual traditions of the east and of Egypt. In the Hindu tradition the Sahasrara or “thousand petaled lotus is the physically description of the seventh major Chakra located just above the head which relates to the highest forms of wisdom and esoteric knowledge. This does not mean that in order to activate this level of being we need to use a Lotus plant but is an interesting coincidence to observe as, if the lotus can help in experiencing lucid dreaming, then I see this as another example of the simple yet complex inter-weaving nature of esoteric symbolism and an example of the hidden secrets or mysteries in the geometry of nature. According to scholars there are suggestions that certain water lilies may have been used for their narcotic properties due to their frequent use as a motif in funerary or burial art not only in Ancient Egypt but also among the civilization of the Mayans. In both Ancient Egyptian and Mayan culture there appears there was a stratification of the priest and shaman casts and that the more spiritual activities were reserved for the priests whereas the shamans were responsible for duties of curing and healing people of illness. In 1922 when the Egyptian tomb of Tutankhamen was discovered the body of the Pharaoh was covered with the petals of the Blue Lotus. 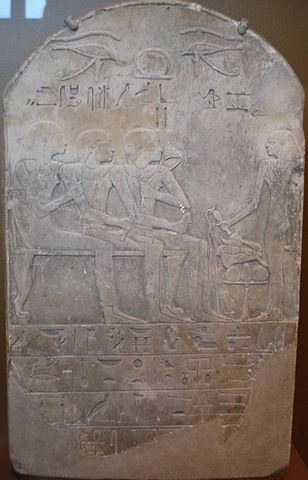 Nefertem is the Ancient Egyptian god associated with the lotus plant and is often depicted holding a lotus on his head. The Blue Lotus plant is considered to be the single most sacred plant of Ancient Egypt as well as the most prized flower above all others and would have been a common sight in Ancient Egypt growing in the pools and banks along the river Nile. Egyptologists deduce the Blue Lotus to be a symbol of creation because out of it flowered the sun-god Ra. In the creation Myth of the Hermopolis Magna the sun rose from the primeval lotus flower and Nefertem was closely linked to the Sun God Ra. There were two species of lotus/water Lilly the grew in the Nile during Ancient Egyptian times. One of these flowers was white and the other blue but it is the blue lotus flower that was often depicted in imagery and because of it’s significance it was often used as a decorative design element of temple columns. The flower only opens for three days and is thought to have been used in elaborate ceremonies centered around the themes of death and rebirth. In many graves and tombs the lotus has been used as decoration, hence the affiliation with death and rebirth as the Egyptians believed in life after death. Nefertem was known as the “Lord of Perfumes”. Gods and Goddesses are often depicted sniffing the lotus flower blossoms. It is thought that the sense of smell was highly regarded by Ancient Egyptians as the rose was used the hieroglyphic sign for the expressions “to enjoy” and “to take pleasure in”. Ultimately nothing outside of ourselves can bring us any closer to emancipating ourselves from our own inner suffering. It is the strength of the spirit which overcomes the subconscious to emerge with more of it’s own light no longer trapped in the darkness of the Ego. Gaining esoteric experience is essential to understanding ourselves and learning valuable lessons about the deeper esoteric significance of this life and past lives. All these mystical teachings can help us to overcome during times of difficulty and inner struggle. These mystical teachings act as sign posts when situations occur where we may unsure and may not understand what is occurring within us simply by observing it. We can observe ourself endlessly but if we do not gain deeper esoteric understanding of what’s happening within we cannot overcome our inner barriers. For me, as I mentioned previously, this lesson on Fear has been the most significant teaching about the different aspects of Fear I have been given thus far. It is still a question for me everyday of letting go and not being attached but also not being complacent in spirituality. No one can see what occurs within others or what mystical knowledge they may have and from the outside things can be easily misconstrued and misinterpreted but this is a part of the challenge of esoteric spirituality. The Blue Lotus is an interesting plant because of it’s significance in Ancient Egypt and through my experience I believe this plant helped me gain a mystical experience. I cannot prove this to anyone in anyway and nor do I wish to I only deduce this from logic, experience and a strong clear intuition that this plant acted as a catalyst for my lucid dream. We cannot awaken through the use of psychoactive chemicals but we may be able to experience something that can show us why awakening may be the thing we are unknowingly searching for in life to bring us happiness. It’s up to each individual to decide what is right for them and have the courage to find their own sense of super individuality through the wisdom of their inner being. It can be easy to follow others, and this is what conventional religion offers people, something to follow. What true Esotericism is about is following your higher self but in order to do so the higher self needs to be experienced and their needs to be a method to accessing the higher self. It’s all too easy for the animal within to convince people of it’s own truths when it lacks personal experience and this is one of the biggest traps people fall into. A true esoteric student does not follow their teacher but they learn from them. Following a Master and learning from a Master are two completely different things. Unfortunately, what too often occurs is that followers gather and become fanatical about a system of beliefs without any mystical experience to confirm what they believe to be true regarding both large scale beliefs and small little details. People are not aware they have the abilities to experience for themselves and to investigate truths for themselves so in this they become spiritually passive and find comfortability in feeling they know the truth or that they are content with their version of the truth, rejecting those who take a more open minded agnostic approach to spirituality and religion. This is the great tragedy of spirituality in the world. All religions and beliefs spring from the same original source of spiritual love and yet over time they move further and further away from one another taking all their followers with them creating greater division in the world. The key to knowing yourself is to Investigate. Not just on higher dimensions but in the physical world also acting with intelligence, learning from information learned on higher dimensions but being also cautious without any fears driving your actions or non actions. As Socrates once said “I am the wisest man in the world because I know that I know nothing”. I’m sure he knew a lot about a lot of things and used this knowledge to great effect in the physical world but what I feel he was alluding to here is that the only thing you can truly know is yourself with all other knowledge often being used by the ego as an addition to your personal sense of identity. Unfortunately the knowledge people possess of things outside of themselves will disintegrate along with their rotting corpses in the grave but the knowledge your spiritual essence has gained of itself will be carried with you after life and is the only possession you have after your life is finished so you might as well make some efforts to gain as much of it as you can while you’re still here. In terms of the Blue Lotus, I think if a plant can be proven to help people gain mystical knowledge of themselves without causing physical damage when used in moderation and at safe levels then I see no reason why it cannot be a small part of lifting the culture of humanity to a more awakened state to enhance global consciousness worldwide.